On the 30th of May, armed motorcycle gang members staged an anti-Islamic rally outside a mosque in Phoenix, Arizona. 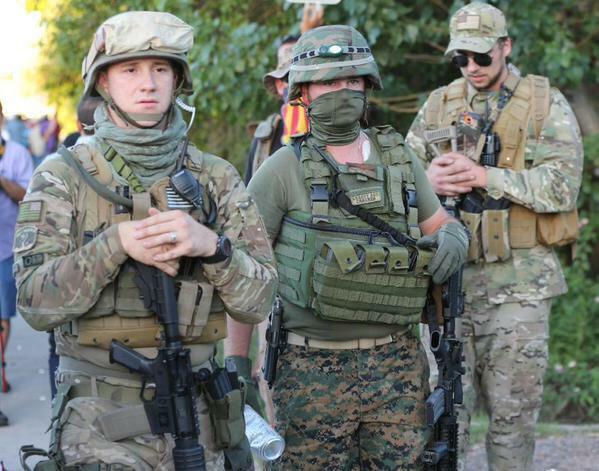 They showed up with semiautomatic rifles and full military gear to draw offensive cartoons while police kept them apart from a larger group of counterprotesters. Many have remarked that the National Guard would probably have opened fire if African-American protesters against police brutality in Baltimore had shown up carrying similar weapons. On the 30th of May, residents of Calvert County backed by environmentalists marched from Solomons at the southern tip of the county to Cove Point. 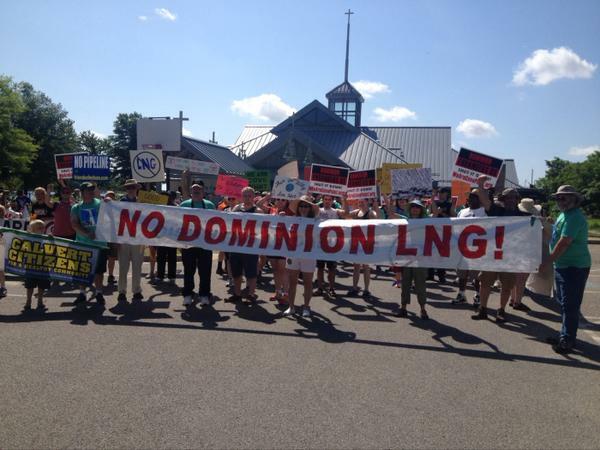 The ending point was a park close to Dominion's LNG plant, the target of the protest. Dominion has begin construction to convert the old LNG import plant into an export facility for far larger quantities of fracked gas. 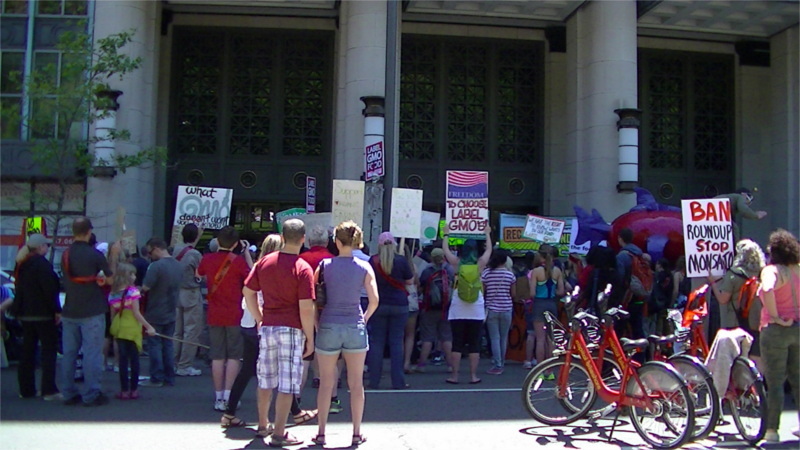 The 29th of May was the last day of the third round of daily protests at FERC by Beyond Extreme Energy(BXE). 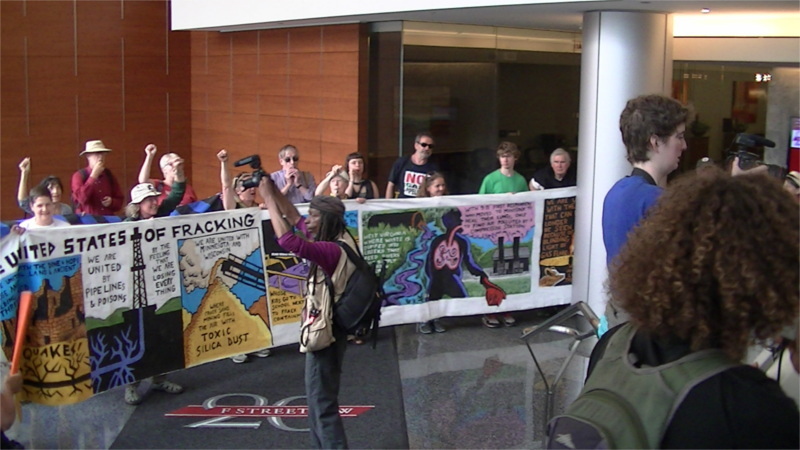 This time around, activists marched from FERC and stormed into the office buildings housing some of their friends. First up was Spectra, builder of the "AIM" pipeline project FERC rubber stamped. Next up was ANGA, "America's Natural Gas Alliance," the notorious gas and fracking lobby. Finally came a suprise: the headquarters of NPR, known for promoting gas fracking with what can only be called public disservice announcements. Read more about The Shortwave Report 05/29/15 Listen Globally! 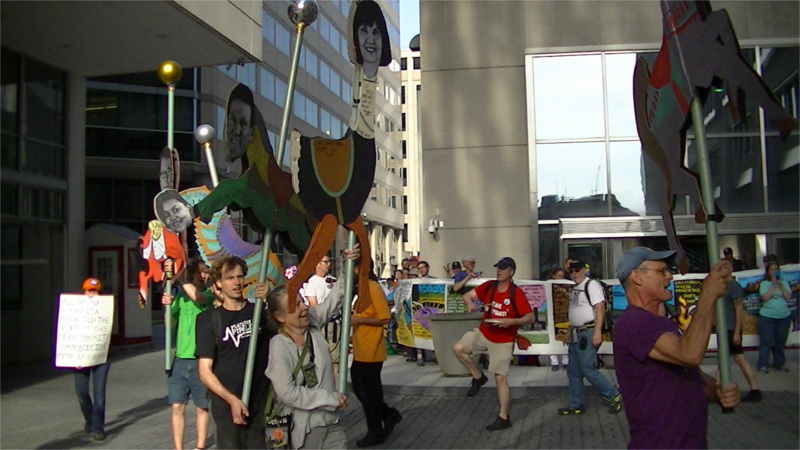 On the 28th of May, the Third Siege of FERC continued with the FERCus-go-round, a circus act that emphasized the revolving door between FERC commissioners and the gas/fracking industry. The commissioners were called weasels, images of their faces mounted on mock carousel horses, a turkey, even a seahorse. Meanwhile, very few FERC staffers tried to run the door blockades, one speaker estimated only a tenth of the normal workforce showed up. On the 27th of May, five activists were arrested while blocking access to FERC on the 4th day of actions by Beyond Extreme Energy (BXE). They stood their ground when the Federal Protective Services/Homeland Security cops gave the "three warnings" and were arrested after a blockade lasting nearly an hour. 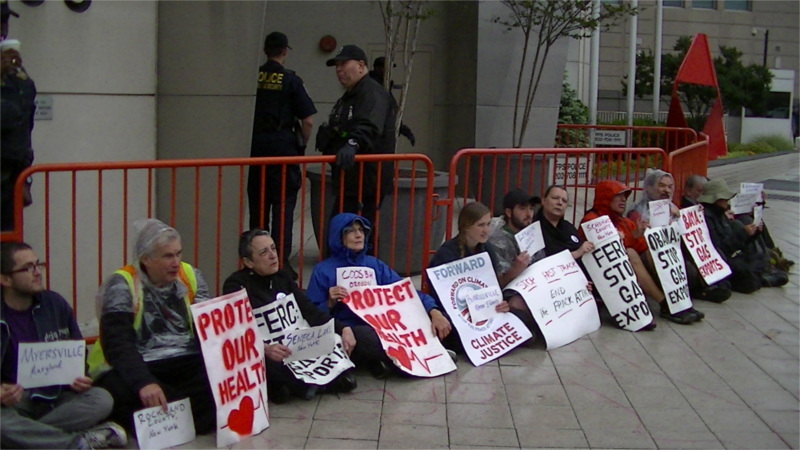 Afterwards protesters held a silent vigil lasting until Noon in front of FERC's headquarters. BXE is demanding that FERC stop acting as the gas industry's rubber stamp for seemingly every gas/fracking infrastructure permit to cross their desks. 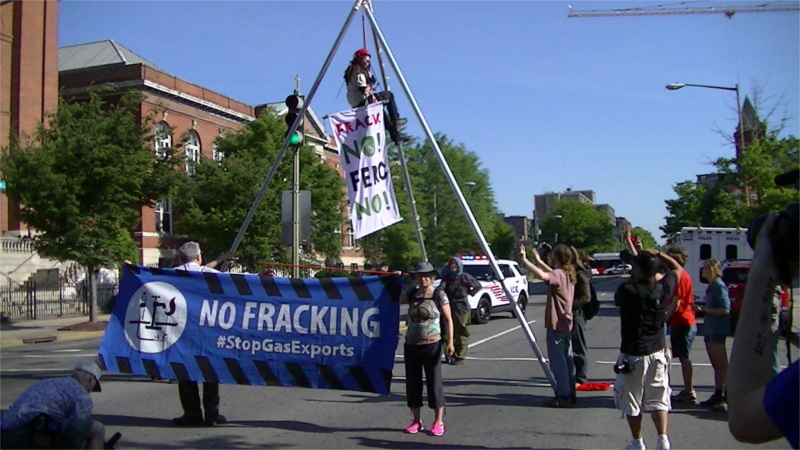 On the 26th of May, protesters from Beyond Extreme Energy (BXE) returned to FERC (Federal Energy Regulatory Commission), blocking all known doorways with banners and seeking to shut down this rubber stamp of the fracked gas industry. Everywhere there were calls for reinforcements but none to send-because activsts had quietly slipped away to set up a tripod in the middle of N Capitol St. The resulting road closures and traffic jams effectively barricaded the whole area around FERC. May 26th 6:30 A.M. Seeds of Peace is serving breakfast in front of Union Station to approximately fifty Beyond Extreme Energy protesters, before the march to the Federal Regulatory Energy Commission to convey dissenting messages in regard to the confusion of fracking shale to extract natural gas, to be processed for eventual sale overseas, regardless of the current depressed price, to keep United States energy companies in business. 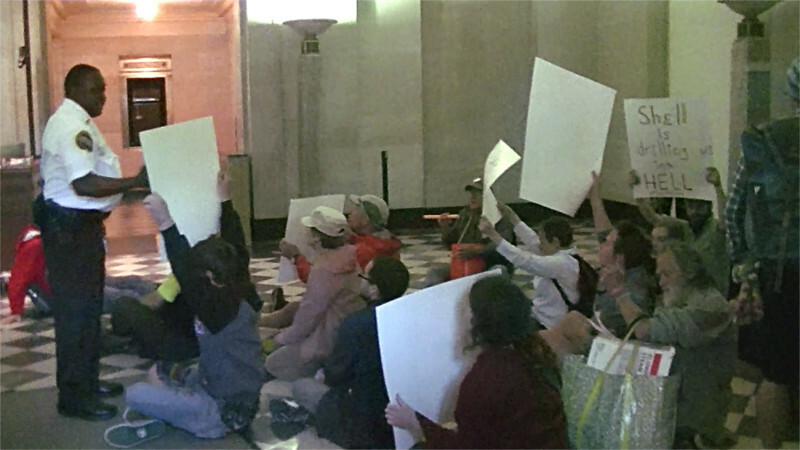 On the 23ed of May, the annual March on Monsanto encountered something new at Monsanto's DC lobbying headquarters: a tiny group of counterdemonstrators. Some were reported to hjave been paid by Monsanto to be there. Their presence is proof that the global campaign against Monsanto's patented "Roundup Ready" seeds and glyphosate herbicides is becoming effective. The 22nd of May was the second day of Beyond Extreme Energy's series of daily protests against fracking, gas export, and other forms of extreme energy. With FERC heavily guarded by cops, protesters diverted across town to the Department of the Interior. Just as FERC rubberstamps fracking and gas export infrastructure permits, DOI rubberstamps oil drilling permits, including Shell's permits for offshore arctic driling. This protest had originally been planned for later in the day, but this way activsts got inside DOI unopposed for the sit-in while all the cops were still at FERC. Read more about The Shortwave Report 05/22/15 Listen Globally! 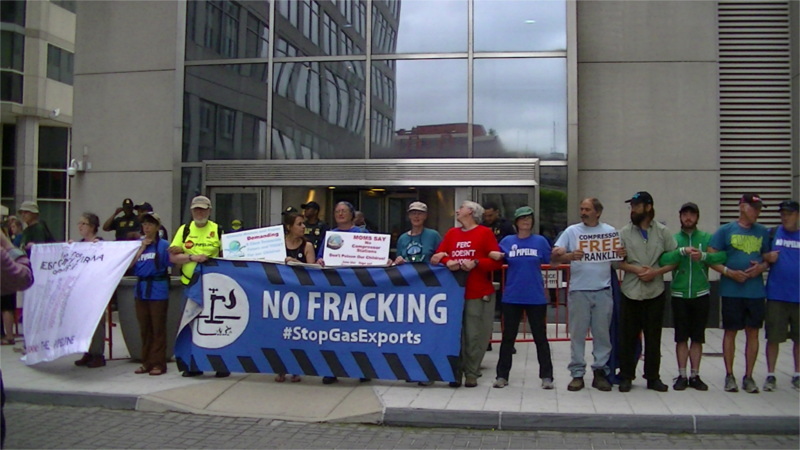 On the 21st of May, the third week-long series of anti-fracking/anti gas export protests began at FERC. FERC, the Federal Energy Regulatory Agency has rubber stamped every application they have received for fracking, gas pipeline, and gas export facilities.